Entertainment retailers are drawing battle lines as they race to add new streaming services and original content in hopes of winning over more viewers. The stakes are particularly high for Coinstar (NASDAQ:OUTR) and Netflix (NASDAQ:NFLX) as the companies struggle to get ahead in an increasingly competitive and capital-intensive industry. Today, let's evaluate these companies and uncover which stock investors should own in the year ahead. The parent company of Redbox DVD kiosks has been getting some negative press lately. Shares of Coinstar plummeted last week after the company reported slightly disappointing results for its fourth quarter, and issued a weak forecast for the current quarter. Despite delivering on the bottom line, the company saw its fourth-quarter revenue slide in at $564 million, whereas analysts were expecting revenue of $581 million for the period. As a result, investors sent shares down 8% last Friday. But that's not all. There is something much more worrisome than investor sentiment for the company these days: increased competition from digital heavyweights Netflix and Amazon.com (NASDAQ:AMZN), both of which have a head start when it comes to streaming movies. Before we jump into the streaming side of things, let's first see how these companies measure up in terms of stock performance. 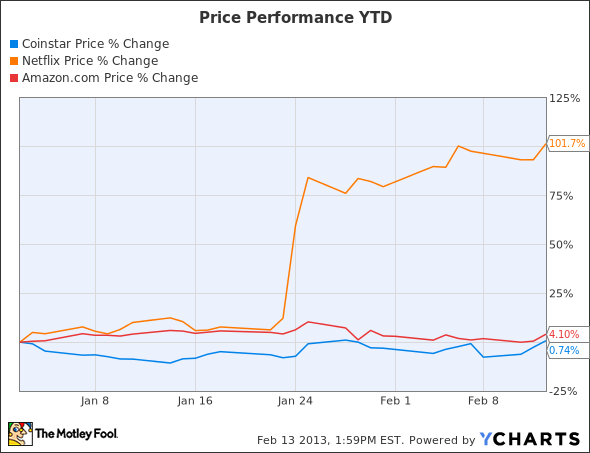 As Coinstar plummeted last week, Netflix locked in more gains for the year. Investors sent shares of Netflix soaring last month, after the company reported better-than-expected fourth-quarter earnings. As you can see in the chart above, Netflix is dominating this year in terms of stock performance. Indeed, the company has come a long way since hitting rock bottom in 2011. But what really stood out in Netflix's most recent quarter was the ballooning number of streaming subscribers. In the fourth quarter, the company added more than 2 million new U.S. subscribers to its streaming service. Overall, Netflix now leads with 27.2 million digital subscribers in the U.S., not to mention an additional 6.1 million subscribers in international markets. As a result, shares of Netflix are up more than 92% year to date. Coinstar's stock, on the other hand, is down year to date. Less surprising is the fact that Netflix DVD rental subscriptions continue to decline. This doesn't bode well for Coinstar, either, whose company is currently centered on the DVD rental business. Nevertheless, Coinstar isn't going down without a fight. The Redbox owner's saving grace these days is its partnership with Verizon Communications (NYSE:VZ). Together with Verizon, Coinstar is pushing into the video streaming business with a new website dubbed RedboxInstant.com. While this is critical to Coinstar's future success, it's also a smart play for Verizon, who holds a 65% stake in the venture. The service is currently in beta and will cost $6, $8, or $9 a month to use, depending on the range of formats and content you choose. This pricing is important if Redbox is going to have a fighting chance against Netflix and Amazon Prime Instant Video. For comparison, Netflix charges members $7.99 per month for unlimited streaming of movies and TV shows. Meanwhile, Amazon Prime members get unrestricted access to Amazon's streaming service in addition to the normal Prime perks like free two-day shipping on eligible items, all for $79 a year. These streaming choices all sound like compelling offers, right? Not exactly. In addition to cost, another important factor to consider is content. According to Mashable, Redbox Instant's beta version now gives users 2,000 movies to choose from. However, don't get too excited. The majority of these titles can also be found on both Netflix and Amazon Instant, since all three companies license content from pay-TV giant Epix. Of course, Redbox has also inked deals with other content providers. But that won't matter, at least not in the near term. Original content and exclusive deals with top content owners have earned Netflix and Amazon Instant a solid lead in the streaming space. I suspect Coinstar's Redbox DVD kiosks will continue to win market share from Netflix on the DVD rental front in 2013. However, Netflix is much better positioned within the streaming video services business, which should reward shareholders down the road. One question remains: Did the recent sell-off in Coinstar create an opportunity for investors to get in at a good price? Given everything we've just covered, my answer is no. I think investors may be better off remaining on the sidelines for now, at least until Coinstar can prove that its "Redbox Instant by Verizon" platform has what it takes to hang with Netflix and Amazon.